Harry Uhane Jim is one of the last Kahuna of Lomilomi, Keeper of the Deep Mysteries of authentic Hawaiian esoterica. He shares the secrets of this ancient oral tradition with readers for the first time in Wise Secrets of Aloha. Recognizing that the world is in great peril, Kahuna Harry was blessed by the Halau Guardians who instructed him to share the true teachings and tools of Lomilomi for the practice of physical, emotional, and spiritual healing. He writes: "Now is the time to share aloha with humanity. `Aloha' means the Breath of God is in our Presence. It is time to reveal the profound Lomilomi secrets of the kahunas for personal and planetary peace." Directions for preparing the path's landscape: In Lomilomi, the physical is a tiny bit. 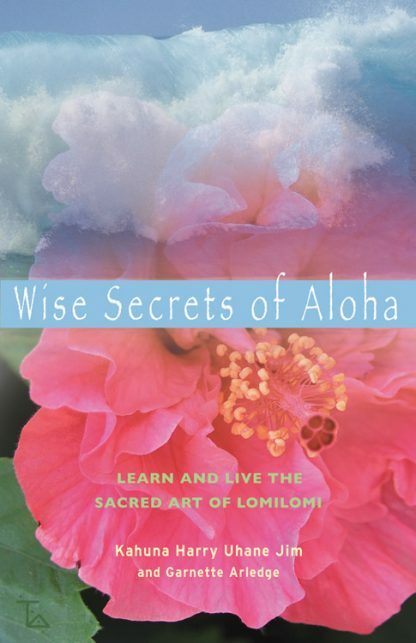 Lomilomi is a mindset, a perspective that generates healing. Say, "I am plenty. I love me. I am enough." Lomilomi gives the body potency, vitality, and rejuvenation. Lomilomi is not what you expect; it's what you feel. Lomilomi is four techniques that simply can be unveiled. Lomilomi is a gift of Spirit to humanity. Lomilomi is emotional evolution. There will be no tests. Nobody fails. Therein is your growth. Wise Secrets of Aloha is as simple as it is profound, as contemporary as it is ancient. It is true to Hawaiian esoteric teachings and available to all who bring the right attitude. Aloha calls. Listen in the the splash of waves, in the breeze-- the air is filled with aloha. All the abundance, joy, and freedom from old wounds readers have ever yearned for can be found by adopting the aloha spirit. Harry Uhane Jim was born on Kauai forty-eight years ago to parents on both sides of the mystery. From the age of eight, Harry was mentored and taught by a succession of authentic Hawaiian Elders, the Kupuna and Kahuna. Trained in surfing, kayaking, and skin diving as spiritual, emotional, and physical routes to the Paa or the Transcendent Now, he went on to give healing treatments in Temple Lomilomi. Beloved author Garnette Arledge had an intuitive flash when she fist met Kahuna Harry that she would work with him on a book. She had to ask him three times before the Halau Guardians said the time was right. She resides in Woodstock, NY.